From the beautiful west coast of Canada comes an extraordinary quintet. Renowned for their instrumental virtuosity, lush vocal arrangements, exuberant live performances, evocative songwriting, and refreshing sound, The Bills truly are a Canadian acoustic music super-group. Last seen at Horizon Stage in 2002 when they were still performing as The Bill Hilly Band, The Bills are thrilled to be returning to Spruce Grove on Sunday, November 17 at 7:30 p.m.
Melding together rock, maritime fiddle, bluegrass, Cajun, Romany, and other genres, The Bills’ unique sonic approach transcends musical boundaries and defies simple categorization. Their original songs coax sublime beauty, energy, and rhythm out of their instruments and feature stunning layers of vocal harmonies. Listen and you’ll hear influences of global roots and rock alongside hints of Chopin, Stan Rogers, and Django Reinhardt. But you’ll ultimately hear The Bills, doing the magical thing that they do. A Bills’ live show is a legendary experience. Since forming in 1996, the band has delighted theatre and festival audiences from Copenhagen to California, thrilling fans with their breathtaking musical explorations and their unscripted onstage wit and charm. In 2006 they were voted Western Canadian Entertainer of the Year, edging out fellow nominees Michael Buble and Jann Arden. Their albums, Let Em Run and All Day Every Day, each garnered JUNO nominations and All Day Every Day won a Western Canadian Music Awards for Roots Album of the Year in 2002. Their latest release, Yes Please, features some of their finest songwriting to date. Whether entertaining an intimate theatre audience or rocking a festival crowd of 10,000, these five gifted multi-instrumentalists are masters at leaving listeners breathless and revitalized all at once. 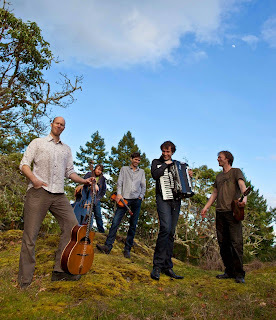 Marc Atkinson, Richard Moody (last seen at Horizon Stage with Woody Holler in October), Adrian Dolan, Scott White, and Chris Frye each sport world-class credentials in folk/roots, jazz, classical, and world music. Called “the biggest blast of fresh air to come out of Canada since The Band” by the Glasgow Herald, The Bills mix a little bit of holler with a whole lot of harmony. Tickets to see them Up Close and Personal at Horizon Stage on November 17 are $35 for adults and $30 for students and seniors. Tickets may be purchased at the City Hall Ticket Centre (315 Jespersen Ave) and by phone at 780-962-8995 or 1-888-655-9090. Online tickets can be purchased at Ticketpro. This concert is proudly sponsored by CKUA, Seal & Bedard Accountants, Travelodge Inn & Suites, Canadian Heritage, and The Alberta Foundation for the Arts.